The First Draft features discussions about higher education, digital humanities, technology, games, and learning. 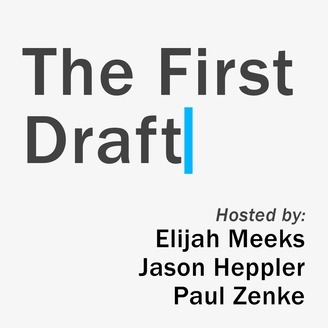 Hosted by Elijah Meeks, Jason Heppler and Paul Zenke. 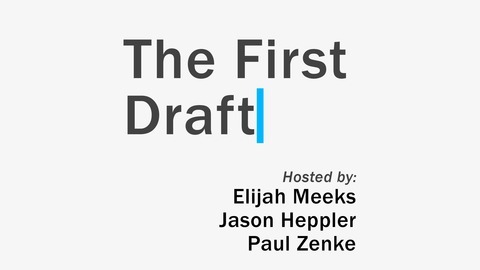 Welcome to Season 3, who are we now?, a discussion of Elijah and Jason’s visualizations of a timeline of wars of the United States, the D3.js Slack team, Jason's dissertation research, and superfund sites in Silicon Valley. Our Town is a 1938 three-act play by American playwright Thornton Wilder. It tells the story of the fictional American small town of Grover's Corners between 1901 and 1913 through the everyday lives of its citizens. Business intelligence (BI) is often described as "the set of techniques and tools for the transformation of raw data into meaningful and useful information for business analysis purposes". The term "data surfacing" is also more often associated with BI functionality. For most of its nearly two and a half century history, the United States has been at war. Some of these wars, like the American Civil War, were terrible and bloody and well-remembered. Others, like the Powder River War, were small and mostly forgotten. One was the result of an individual military officer disregarding orders and invading Mexico to retrieve stolen cattle. I'm not suggesting my view is better than Elijah's; his timeline is making a particular point, and I think makes that point well. The point of his visualiation remains: the United States fights wars, and lots of them. But this view tries to reveal the regions of the world the U.S. fought those conflicts. I also extended Elijah's original dataset, including covert operations run by the United States during the Cold War. The timeline above seeks to provide another view, by looking at the regions of the world where these conflicts were fought as a way to see where the United States engaged over time. This is a list of armed conflicts involving the United States of America since its founding during the American Revolution. TimelineJS is an open-source tool that enables anyone to build visually rich, interactive timelines. Beginners can create a timeline using nothing more than a Google spreadsheet. Experts can use their JSON skills to create custom installations, while keeping TimelineJS's core functionality. A pragmatic data model, D3 layout, and Python functions for representing complex and/or uncertain periods and events. If you are lucky, in a dusty used book store or flea market, you may someday happen upon a copy of Mark Twain's Memory Builder, a history game developed by Samuel L. Clemens in the mid-1880s and debuted in 1892, an obscure treasure by one of America’s great writers, an old game of memory almost entirely forgotten today. "I created a #d3js slack team (http://t.co/xymBSCKjnM) for anyone who wants to talk D3.js. DM me with an email address if you want an invite." Join today! Machines in the Valley is a digital history project that serves as a companion to my dissertation. Between 1945 and 1990, the Santa Clara Valley experienced profound environmental change during an unprecedented wave of urban and industrial growth. With those changes came conflict over landscape change. Answering that question means extending historian Kenneth Jackson’s observation that “the space around us—the physical organization of neighborhoods, roads, yards, houses, and apartments—sets up living patterns that condition our behavior.” In Silicon Valley, the attitudes, ideas, and values that people impart on to nature—biological and idealized—reveals how ideas about nature played out in postindustrial American society. By examining the ways that people created place, the politics they engaged in to protect that place, and examining the physical changes to the landscape that resulted, my research argues for the importance of understanding how space creates politics. The story revolves around whose space Silicon Valley would become: A postindustrial trend-setter? A fertile and beautiful agricultural producer? A countryside paradise? A metropolitan leader? My Neighbor Totoro is a 1988 Japanese animated fantasy film written and directed by Hayao Miyazaki and produced by Studio Ghibli. The film – which stars the voice actors Noriko Hidaka, Chika Sakamoto, and Hitoshi Takagi – tells the story of the two young daughters (Satsuki and Mei) of a professor and their interactions with friendly wood spirits in postwar rural Japan. The film won the Animage Anime Grand Prix prize and the Mainichi Film Award and Kinema Junpo Award for Best Film in 1988. It also received the Special Award at the Blue Ribbon Awards in the same year. This is a list of Superfund sites in California designated under the Comprehensive Environmental Response, Compensation, and Liability Act (CERCLA) environmental law. The CERCLA federal law of 1980 authorized the United States Environmental Protection Agency (EPA) to create a list of polluted locations requiring a long-term response to clean up hazardous material contaminations. The 22-acre Fairchild Semiconductor Corp. (Fairchild) facility (former South San Jose Plant or Site) is located west of Highway 101 about nine miles southeast of downtown San Jose near the intersection of Monterey Highway and Highway 85. The Site is located in a light industrial and commercial area. The plant was constructed between 1975 and 1977 and used for electronics and semiconductor fabrication from 1977 to 1983. Solvents containing volatile organic compounds were used at the Site. The U.S. Environmental Protection Agency (EPA) is hosting a community meeting Dec. 10 to engage Sunnyvale community members in plans to test the indoor air quality in some of the schools and homes in the Duane and San Miguel avenues neighborhood. Hetch Hetchy is the name of a valley, a reservoir and a water system in California in the United States. The glacial Hetch Hetchy Valley lies in the northwestern part of Yosemite National Park and is drained by the Tuolumne River. For thousands of years before the arrival of Europeans in the 1850s, the valley was inhabited by Native Americans who practiced subsistence hunting-gathering. During the late 19th century, the valley was renowned for its natural beauty – often compared to that of Yosemite Valley – but also targeted for the development of water supply for irrigation and municipal interests.